We do not curently have theatre tickets available for Black Star Riders. This could be because we have simply sold out or it could be that this show is no longer running. The information on this page remains purely for historical and informational purposes. 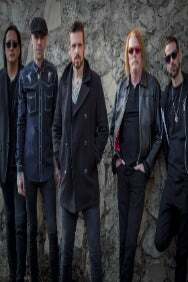 Black Star Riders are a recognised power force in the modern day rock world and they’ll bring plenty of the high-energy, full-throttle sound to cities on their autumn tour. The shows will follow the release of their fourth studio album, Another State Of Grace, giving you the chance to be one of the first to hear the new material live.